You may have noticed that Intel has a new 'Rock Stars' marketing campaign on the go. It features product engineers who have a major impact on our computing lives but are largely unheralded in wider society. To Intel, these people are rock stars. The first instalment features Ajay Bhatt, co-inventor of the USB interface. And one can understand why Intel chose to kick off with USB. It's the ultimate invisible technology, incredibly useful and successful to the point of utter ubiquity. However, it does have its limitations. Over the last year, one such limitation has been bandwidth. With ever faster solid state drives appearing on a seemingly daily basis, it's becoming obvious that USB needs a refresh. For instance, the gap between drive performance via USB and that of a dedicated storage I/O such as SATA is enormous. Fortunately, there's a solution in hand with the arrival of new standard USB 3.0. The big news, of course, is increased data rates. USB 3.0 ups the ante to a quite astonishing 4.8Gbps. To put that figure into context, the USB 1.0 specification allowed for just 1.5Mbps. That grew to 12Mbps with USB 1.1 and then to 480Mbps with the arrival of 2.0. Crucially, backward compatibility was maintained throughout. However, real-world USB data rates tend to be rather less than the advertised maximum. USB 2.0 peripherals, for instance, have a theoretical maximum of 60MB/s but rarely breach 35MB/s in practice. Nevertheless, if USB 3.0 can deliver 300MB/s or more, that will be enough to do justice to even the fastest SSDs for some time to come. Indeed, to understand just how big an impact USB 3.0 will have, consider this. Currently, backing up a 1TB hard disk via USB consumes around five hours. With USB 3.0, it should be possible in around 30 minutes. That's the difference between squeezing your backups in at the end of the day and the need for careful planning. Our first taste of USB 3.0 comes courtesy of Asus' 7P55D-E Pro, an updated version of its popular Intel P55 motherboard that's compatible with Core i5 and Core i7 processors in LGA 1,156 trim. USB 3.0 support is achieved via NEC's 720200 – a dedicated controller that connects to the P55's PCH chip via PCI Express. The kicker is that the 7P55D-E Pro also packs a SATA 6Gbps I/O interface. Combined with USB 3.0, this gives you every chance of maximising drive-todrive performance. Exciting stuff, but as ever, there are a few caveats. Importantly, performance will only be as good as the drives you use. There's little point in upgrading to USB 3.0 while retaining ancient hard disks. Also remember that you'll need an end-to-end solution. In other words, both your PC and the plug-in peripheral in question must fully support USB 3.0. Currently, that can be difficult to achieve due to the scarcity of hardware.It's very early days for the technology. The final part of our test package is an Asus USB drive enclosure that again combines an external USB 3.0 interface with internal SATA 6Gbps I/O. It's an early engineering sample rather than a fully finalised product, but in performance terms it's representative of what you can expect. All of which leaves the most important question of all. Does USB 3.0 deliver? With a conventional magnetic disk installed, we measured sustained read and write rates of around 100MB/s. That's very much in line with the maximum performance of the hard drive itself and further underlines the importance of underlying disk or SSD performance for USB 3.0. 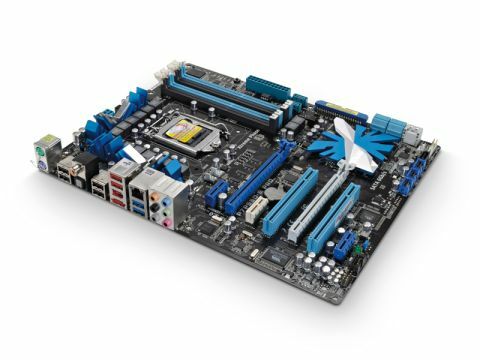 Handily, the 7P55D-E Pro board sports both USB 3.0 and legacy 2.0 ports, allowing a direct comparison to be made. With the same drive and enclosure connected via USB 2.0, the read/ write rates dropped to 30MB/s and 25MB/s respectively. Even with a conventional magnetic hard drive, therefore, USB 3.0 delivers over three times the throughput of USB 2.0. Drop a speedy SSD into the enclosure and performance will only improve.